It all started in 1987, when a one-man iron working workshop was established. From the very beginning of its activity, a small craft enterprise focused on the production of components of rollers for belt conveyors. The high quality of elements created at that time caused that the offered products met a very good reception of the market, which in turn resulted in an increasing number of orders flowing from Polish companies. The natural consequence of the enormous success of our products was the further development of the company both in terms of infrastructure and technology. In 1992 we introduced a new branding of the company under the name of Przedsiębiorstwo Produkcyjno-Handlowe INTERkrąż. Along with image changes, we have also expanded our product offer, offering our customers the complete rollers for belt conveyors. We started our activity in a production and warehouse hall built in 1986 having a total area of 150 m2. The rapid development of the company required us to constantly modernize and expand the plant until 2005, when the largest reorganization of our plant took place. 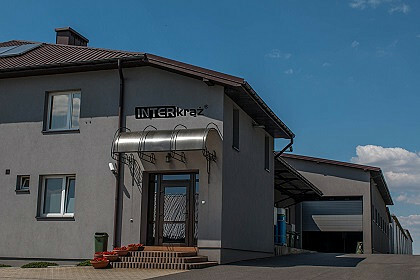 In 2006 we established a commercial company, which was registered in the National Court Register as INTERkrąż Spółka z o.o. In 2008 we started the production of a completely new product group, namely steel structural elements for belt conveyors. Observing the constant changes taking place on the Polish and international market, as well as analysing the needs and expectations of our Customers, in 2011 we have decided to build a new, modern production plant that will meet all the requirements of both us and our Contractors. 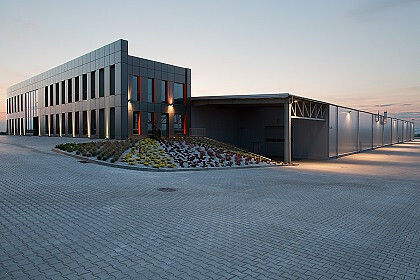 The investment, located in Trzyciąż, Małopolskie Voivodeship, was completed in 2013. The new production and warehouse hall offered the production facilities of a total area of 8,000 m2. Over time, the area of the production hall has grown to over 12,000 m2, which is 70 times the area of the original production and warehouse hall. Along with the modern production facilities, we have also commissioned a new administrative and social office building of the company of a total area of 1,000 m2. Our company currently creates workplaces for nearly 150 qualified and experienced employees. In 2012 we have introduced the roof bolts elements to our offer. After more than 30 years of activity, starting practically from scratch with a two-person crew in a modest iron working workshop, we have created a strong brand, recognizable both in Poland and abroad, becoming at the same time the leader in the production of rollers for belt conveyors on the Polish market and in Central and Eastern Europe.